PYEONGCHANG, Korea, Republic Of -- When Gord Downie died last October, Tessa Virtue and Scott Moir decided to honour the Tragically Hip singer the way they knew best. 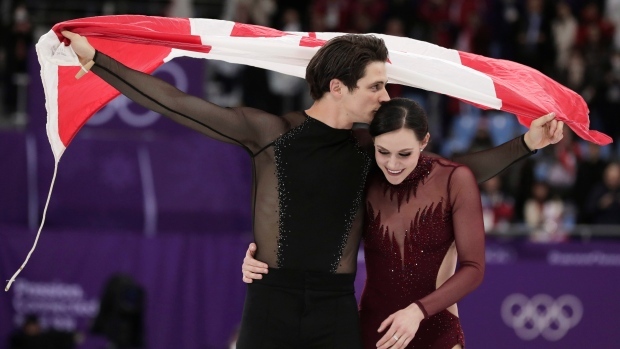 Virtue and Moir captured a pair of gold medals at the Pyeongchang Olympics, and will skate to the Hip's "Long Time Running," at figure skating's gala on Sunday. "When I think about Gord and I think about the Hip and what they've been able to do, it's kind of the soundtrack to being Canadian almost," Moir said. "It's special for us that we get to skate to the Hip, and it's our tribute to one of my heroes and a guy who was so wonderfully weird, and just how he embraced life." Downie died of brain cancer on Oct. 17 at age 53. Virtue and Moir were preparing for Skate Canada International at the time, and decided to quickly choreograph a gala program to the poignant Hip song from their 1991 album "Road Apples." Virtue, in a flowing red dress, and Moir, in all black, debuted the program on Oct. 29 at Regina's Brandt Centre -- to roaring applause and plenty of goosebumps. "We're both huge fans, and Scott just asked if we could somehow choreograph a little tribute and we thought maybe it would only be for that one competition, but it's been lovely to take the ice and to celebrate a Canadian hero, and it means a lot to us," Virtue said. "The lyrics of 'Long Time Running' also are easy for us to connect with for our career, but we're really looking forward to performing that on Olympic ice." "Long Time Running" was also the name of a documentary that followed the Tragically Hip's heartrending cross-Canada farewell tour of 2016. The gala is a curtain-closing tradition in figure skating. Medal winners each skate to exhibition programs that have virtually no rules -- all show and no competition, and beloved by figure skating fans. At the 2010 Vancouver Olympics, Joannie Rochette skated to Celine Dion's "Vole" -- one of her mother's favourite songs -- at the exhibition gala. The Canadian won bronze in Vancouver just days after her mom died of a heart attack.